Except for a thumb smudge on the right edge of the front cover, this April 1979 copy of FM is in Mint condition. 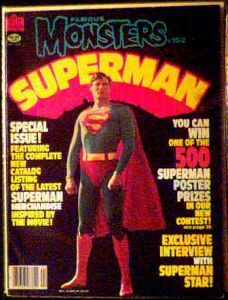 Features article and photos from the first Christopher Reeve Superman movie. Chris Reeve has got to be one of the most inspirational actors alive today. He has come back after his horrible accident and gotten his career back on track by acting, directing, and being a role model for handicapped people around the world. Website design and hosting by Sohodojo Business Services. Item 129 of 466 items displayed in viewer. 0 items in cart.